Report writing is always a stressful time of year for teachers. To a new teacher, the task can become quite overwhelming. Where do I start? What do I write? How can I individualise my reports? The main aim of a report is to inform parents and students of a student’s achievements at the time of reporting. It provides information on the progress the student has made since the last reporting period and outlines suggested steps that can be taken to ensure improvements are made. To assist with your next reporting period, we have outlined ten helpful tips for writing student reports. When writing reports to parents, it is important that you make each comment easy to understand. 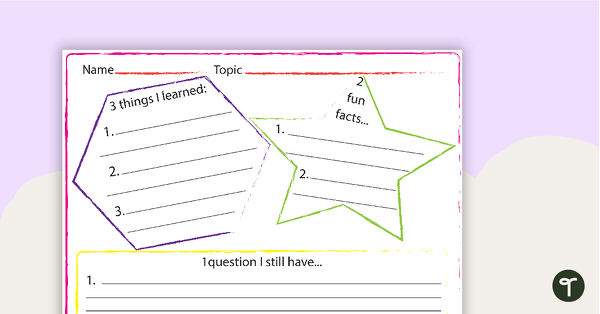 Try to use two connected ideas per sentence to explain how the student is progressing. For example: ‘When problem solving, Sarah needs to explain her mathematical thinking’ (first idea) ‘rather than recording the answers’ (second idea). When report writing, it can be very easy to divert from the point and include unnecessary information. Parents only need to be informed about important matters that are relevant to their child. Unnecessary information will only cause confusion. For example, instead of ‘John delightfully expresses a range of different ideas during whole class discussions in our inquiry sessions’, write ‘John participates in class discussions and shares his ideas with others’. Most parents don’t know ‘teacher talk’. Avoid using teacher jargon and specialist terms when writing reports. Present information in a clear and precise manner which makes it easy for parents to understand. For example, instead of ‘Grace applies a range of higher order thinking skills and comprehension strategies when decoding texts’, write ‘When reading, Grace uses a range of skills to identify the meaning of the text’. When report writing, try to avoid detailed curriculum descriptions or lists of all the units and activities you have covered in class. Parents want to know how their child is performing in relation to the expected levels of achievement, as well as the areas in which their child needs to improve. When reading their child’s report, parents want to know what was learned, how well their child performed, whether there are any areas for improvement and what should be done for their child to meet the next achievement standard. Try and avoid any comments that may only refer to task completion or that only provide an evaluation. For example, instead of ‘Emily has completed the required writing task’, write ‘Emily has achieved a personal writing goal by constructing an informative text without the use of a scaffold. She is now working towards punctuating her writing correctly’. When writing reports, continuously refer back to samples of students’ work. Use these work samples as evidence to indicate individual student achievements against the standards, or in comparison to other students in the class. Base your comments on quality evidence and be prepared to provide parents with examples of their child’s work. Evidence also includes data collected by the teacher; such as anecdotal notes, tracking sheets and a record of scores. Ensure you have evidence for areas of strength and improvement, ways in which the school has or will support the child and how parents can assist their child at home. Collecting data throughout the school year is greatly important for report writing. It enables you to track the progression of each student and their learning, as well as provide you with a collection of quality evidence. Don’t leave your collection of data and report writing to the last minute. This will not only create stress for you, but for your students (who will certainly not appreciate being given a year’s worth of assessment tasks in one week!) Keep a scrap book to take notes as you walk around the classroom, use samples of work from daily activities, or take photos during group tasks. The more you collect, the more evidence you will have and the easier it will be to write your reports. Prevent the chance of leaving something out or writing too much by using a report writing checklist. A checklist will ensure that you have included student achievements, areas for improvement, what the school is doing to support the student and their learning, suggestions for the parents to help their child progress and a general comment with new learning goals. There will be times when you will need to write a report that doesn’t reflect the expectations of the parents. If you are aware that a child is not going to achieve a standard or has required additional support to complete set tasks, then it is strongly recommended that you interview the parents of those children, prior to them receiving their child’s report. When meeting with parents, have an open conversation about how their child is performing in class and what support you are already providing, with suggestions for the future. Create a partnership with the parents and provide them with suggested activities to support the child at home. Continue an open dialogue with the parents about the progress of their child. Parents greatly appreciate being informed about their child personally from their teacher, instead of waiting for a report card to read about it. 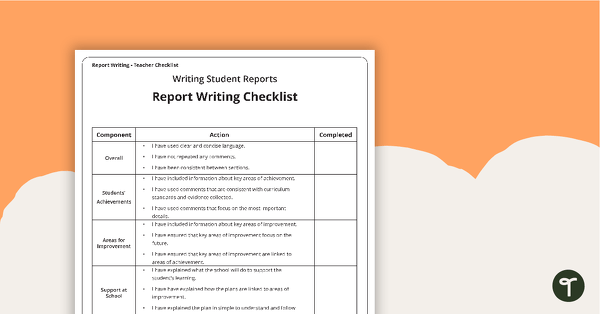 When writing reports, try to involve the students as much as possible. Get students to set personal learning goals and evaluate these goals at the end of the learning period. Let the students identify their own strengths and areas that need improvement. Include these learning goals and evaluations in your reports to make them more personal and to give students some accountability for their own learning. 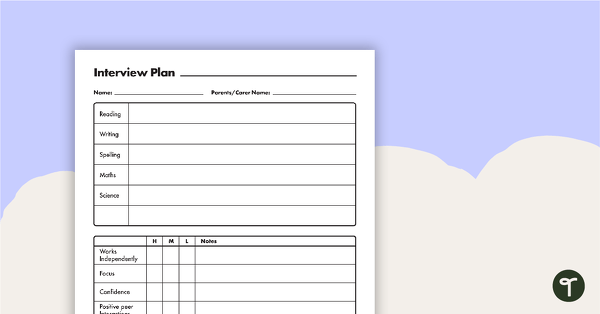 A planning template for parent teacher interviews. 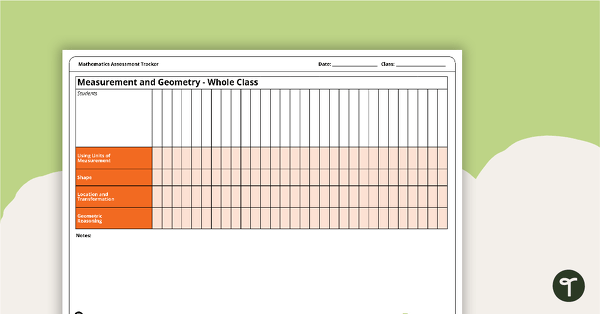 A 24 page set of assessment trackers using the Australian Curriculum codes to monitor student progress in Mathematics. 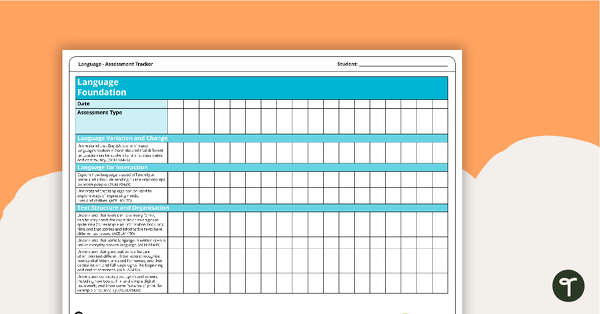 A 47 page set of assessment trackers using the Australian Curriculum codes to monitor student progress in English.